To say I love decorating with stylish Christmas decor is a little bit of an understatement (the many Christmas bins in my garage are a sign of my obsession). LOL It’s pretty much my favorite activity of all time, as decorating my home each year brings me such joy and is something that I look forward to. Make a DIY Farmhouse Wood Christmas Sign! This year I really loved the idea of having a large focal point Christmas sign over my mantel. Rather than buy another item for Christmas, I just switched out the kindness themed free printable poster we featured a few months ago to a new Christmas design. I still LOVE my frame, and I was able to make it for under $20! Now I can just swap out the poster for different seasons and looks. You can also buy an inexpensive poster frame and that’ll do the trick, too! Also, here are some additional 24×36 wood frame options I found online from Amazon.com, Joann.com, and Target.com. Here’s the new Christmas print! 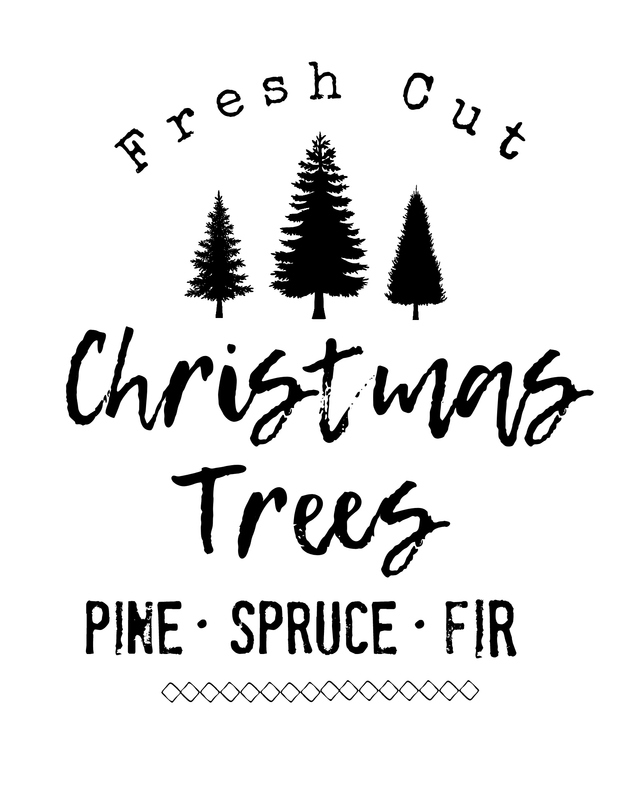 I designed my own version of these trendy Christmas Tree signs I’ve been seeing online and in retail shops. I love that it’s a simple black and white typography sign, and you can have yours printed as a larger size like mine, or a smaller size if desired. All I did was order a 36 x 24-inch black and white engineer print from Staples. These are typically used for building plans, but they can also be used to make inexpensive home decor posters when printed in black and white! Then I used permanent double-sided tape to secure my print to the wood, making sure the paper was smooth and had no bubbles. How can I order an engineer print? Save the image you want to use to your phone or desktop computer. Go in store and ask for the printing store’s email address to send image. You can call ahead too if desired. I used Staples, however you can use another printing shop. Order an engineer print in black and white. If you wanted thicker paper for whatever reason, here’s where you can ask how much a thicker paper would be and decide from there. Wait in store or pick up your print later depending on how busy they are. Place your print in either a DIY wood frame, or buy a frame. EASY! Hip Tip: If you ever see a FREE printable on Hip2save.com you’d like to print, but feel like colored ink is too expensive from your home computer, consider having it printed, using the same method as above! I have a locally owned UPS store near me that has pretty cheap 8×10 colored prints, too. What a FUN focal point for my mantel! I love that I’m able to re-use my wood frame by just replacing it with a $4 print! It looks much more expensive than that, in my opinion. Such a great project. What do you think? Up Next: Christmas Farmhouse Decor Your Thing?! Print These for FREE! Stoppp you’re just too talented. Please come decorate my home! I totally would! 🎄THANKS so much. I love the fonts you used! Do you mind sharing which ones they were? How did you make the frame? Is there a tutorial I missed? I just followed your instructions and placed the order with Staples!!! I am SOOOOO excited! I can’t wait to pick it up tomorrow! Thanks!